Lan Guo joined Laurier in the year 2008. Her research interests include performance measurement, incentive designs and other behavioral topics in management accounting. In her research, she uses both experimental and survey methods. She has taught financial accounting and management accounting to undergraduate students and co-taught PhD seminars. 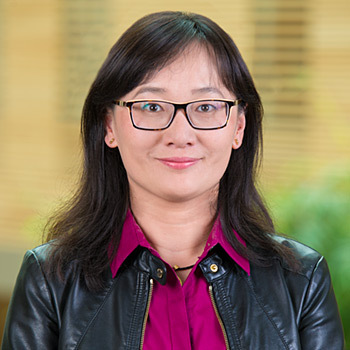 Prior to her academic career, she worked as an accountant in China Securities Depository & Clearing Corp. (Shanghai) and Construction Bank of China (Shanghai). She is a CPA, CMA and CGA. Guo, L., T. Libby, X. K. Liu and Y Tian. Forthcoming. Vertical pay dispersion, peer observability, and misreporting in a participative budgeting setting. Contemporary Accounting Research. Guo, L., T. Libby, B. Wong-On-Wing and D. Yang. 2019. Strategy evaluation when using a strategic performance measurement system: An examination of motivational and cognitive biases. Advances in Accounting Behavioral Research 21: 97-126. Guo, L., T. Libby and X. K. Liu. 2017. The effects of vertical pay dispersion: Experimental evidence in a budget setting, Contemporary Accounting Research, 34(1): 555-576. Bendoly, E., L. Guo, Y. Hu and J. Tobias. 2017. Organizational antecedents and operational outcomes of production-sales bilateral information exchange. International Journal of Operations and Production Management 37 (8): 1031-1053. The paper won IJOPM’s 2017 Outstanding Paper Award. Zheng, P., C. Ren and L. Guo. 2017. Social responsibility information disclosure, media report and individual investors’ investment decisions, Business Management Journal (China), 556 (4): 37-50. Guo, L., D. Stone, S. Bryant, B. Wier, A. Nikitkov, C. Ren, E. Riccio, M. Shen, S. Trabelsi, L. Zhang. 2013. Are consumers’ financial needs and values common across cultures? Evidence from six countries. International Journal of Consumer Studies 37 (6): 675-688. Guo, L., B. Wong-On-Wing, and G. Lui. 2013. Input-based performance evaluation, incentive intensity, and proactive work behavior. Advances in Management Accounting 22: 185-223. Guo, L., B. Wong-On-Wing, and G. Lui. 2012. Motivational effects of linking incentives to different measures in strategic performance measurement systems: Implications for proactive strategic behavior. Advances in Management Accounting 20: 209-240. Wong-On-Wing, B., L. Guo, and G. Lui. 2010. Intrinsic and extrinsic motivation for participative budgeting: Antecedents and consequences. Behavioral Research in Accounting 22(2): 133-153. Wong-On-Wing, B., L. Guo, W. Li, and D. Yang. 2007. Reducing conflict in balanced scorecard evaluations. Accounting, Organizations, and Society 32(4-5): 363-377. Farrar, J. and L. Guo. 2018. Structural equation modeling in Behavioral Accounting Research. In Routledge Companion to Behavioral Accounting Research, edited by T. Libby and L. Thorne, pp. 388-399. Shi, C. V., and L. Guo. 2012. Profit target setting for multiple divisions: A newsvendor perspective. In Handbook of Newsvendor Problems (pp. 341-359). Springer New York.